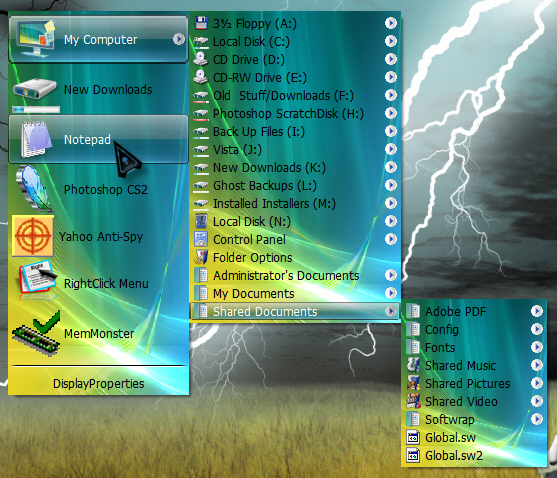 I liked the new Vista RTM wallpapers so here is my version of a rightclick skin using it! Ok I reuploaded it with your email suggestions! Please approve. WOW I made it in thanks guys! one of the stand alone best so far, thank you. I am glad ya like it! I have a few other but could not get them submitted, I do have permissions from image authors but not in email with the headers.... SO no luck here, catch me at deviant! omg i almost shat myself when i saw this...i downloaded right click just for this one....omg thank you its like the nicest ever !! how did you make like, the ''big'' options ? like in the pic on the left the ''my computer'' and stuff ..how did you make them big buttons loll? To make the icons big ya just change the image sizes. @Tollison, what can you not get to work, please tell me more maybe I can help you out! Well i looked at the how to use and im not really good with computers so i dont know what to do. if you would tell me step by step how to get it to work that would be good lol. But it's ok if u dont want to. Btw i love that rightclick thing u made. If you want to talk by msn or email my email is russianlapdog@hotmail.com.